The goal of opening a company for most entrepreneurs is to make a lot of money. The problem is that it can be hard to find the right strategy or the right fundamental assumptions that enable you to develop the actions which lead to financial success for your business. Choosing the wrong strategy or starting from the wrong fundamental assumptions may lead to the loss of time, resources and ultimately, the loss of money for your business. The reason that you are having a hard time making your first million dollars is because you do not know what it takes to produce that amount of money. You have no experience in making a lot of money, so the concept is foreign to you. A really good way to understand how to make your first million dollars is by adhering to the advice given by those who have experience in making millions of dollars year after year. Receiving advice from successful millionaire entrepreneurs will cut your learning curve in half – saving you from wasting time doing things that do not work and leave you frustrated. You can eliminate such hassles by reading the information below, which explains how 11 successful entrepreneurs created businesses that generate millions in revenue. If you want to produce the same results continue reading to learn how. You cannot possibly make millions of dollars without having a strong foundation that supports your activities. Trying to do so would have you fighting battles on two different fronts. First, you would be trying to develop business operations that have yet to produce results. Secondly, you are pushing products and services that are not demanded by your customers. This causes you to lose focus on improving your business because you are too busy working within your business doing damage control or just simply struggling to survive. It is important that you have a solid business foundation developed before you seek to expand your business. Your operations include: strategy, marketing, sales, and products/service development. All of these business functions need to be performing at high levels if you want to generate high revenue. The reason for this is because a setback in any area of your business operations will cause a disruption within your entire foundation, making it difficult for you to even begin making big money. Once you have a solid foundation, your business basically operates on autopilot. You can then start to maneuver and strategise ways to create a multi-million dollar company. Consistency and stability within your operations are crucial to the growth of your business. You operate a business with people and for people. This means that you have to constantly interact with other people to move your goals forward. The thing about people is that they are filled emotions and their opinions often tend to be different from your own. When dealing with such factors you cannot just dismiss other people’s thoughts and feelings because you feel they are not valid. This will only cause people to distance themselves from you – making it hard for you to achieve the goals you have set for yourself. You have to realize that you cannot always force your opinions onto other people. You will actually have to take the time to understand their perspective in order to cooperate with them and move your initiative or agenda forward, Successful businesses are built on excellent cooperation and collaboration towards shared goals – people from different sides coming together to realise a unified vision that everyone works to accomplish. You will need to operate in this manner if you want your business to generate a consistent flow of high-value revenue. Remember tactical empathy when you next feel the urge to dismiss someone else’s opinion or idea. People do business with those that they like. You need to be personable and attractive to people if you want them to consider your business as the best provider for their particular need. You become a person who is great at attracting people by studying and understanding the different types of personalities prevalent among people and how best to deal with each. Doing this develops your emotional intelligence, which makes you better at adapting to the different people that you deal with. With this skill, you will be able to get people on your side, wanting to do whatever they can to help you succeed. You must remember that you are not the only person who is trying to win at the negotiating table. You have goals that you are trying to accomplish and the other side have their own goals that need to be accomplished. All parties need to lookout for the benefit of one another if the goal is to establish a long-lasting working relationship. When this is achieved, you have people that you can reach out to that are willing to work with you to get whatever deal you need done if they have the resources to push the deal forward. You have to know when it is time to cut your losses and move away from situations that are costing you money, rather than adding money to your pockets. Too many entrepreneurs stay stuck in bad deals because they feel the negotiating period has ended. Business is always up for negotiation. When you feel that you are not getting the best deal, you can propose new options that are better for your business. You will tend to find that your vendors and even customers will relent in order to keep your business. Selling is the lifeline of every business. If you cannot sell your products and services, you can forget about your business making any money. You need to create your sales goals and actively work towards achieving them. Do not be afraid of selling to people from all walks of life, however daunting the prospect may seem. The inevitable rejections you deal with will help you improve your sales technique to become a better seller. After a while, the ’No’s will start to become ’Yes’s because you know how to pinpoint the exact personality you are dealing with, the problems they see solutions for and the exact value they are looking for in your product. When selling, you need to focus on a mixture of activities to create a steady flow of sales. Beyond merely making countless cold calls, consider investing in email marketing and being a vendor at business events. You want to engage with as many people as possible in order to increase your leads, which leads to a boost in sales. When you are proposing deals, the goal should be for every party to win. When people feel as if you are trying to screw them over, they will back out of negotiations, which causes the deal to fall apart. To keep this from happening, you need to know what everybody’s motivations and goals are and seek to make the best possible deal for all of them. This allows you to move forward to accomplish your own intended goals. Business involves taking risks. And you will have to take risks when working towards achieving higher levels of success. But you should never take unnecessary risks. Leveraging all of your money on one deal is insane. If that deal does not work out, you lose everything that you have worked hard to build. You should only be willing to lose money that you can afford to go without, and even then, try your best to limit all exposure to a maximum of 20% of assets. As a business owner, you do not make money by trading hours for dollars. As the business owner, you are the one who is supposed to bring in big projects. Make sure you have your employees handle the work. The more work that your employees can do, the more money that you can make. Therefore, create systems to harness their abilities to the highest possible degree while taking care of their career development and job satisfaction. Don’t do their job and don’t micro-manage. Trust them and develop their abilities to do such a good job that you seldom have to supervise or check their work. You are paid for your vision and the product or service you developed and your employees are paid to produce your product in mass quantities or to handle your services. You must have a constant, semi-automated and organic flow of leads coming into your business if you want constant sales. Without leads, your business will have to directly chase down customers, which is not fun and seldom well-received by prospects. Your marketing channels need to be well developed to effectively communicate the value of your business inexpensively while generating a consistent flow of leads. From there, you need to have a well-designed sales funnel that nurtures your leads into paying customers. Make it predictable by using the right software, focusing on the right metrics and performing A/B tests wherever possible to tweak the effectiveness of your lead generation. With this predictable foundation, you are well-primed for million-dollar success. Sometimes you are your biggest hindrance in getting a deal done. You focus too much on what matters to you, rather than on focusing what matters to the person who you are proposing the deal to. You need to learn about what their goals are, what is valuable to them, and how you can be an asset to them. When you do this, you can effectively communicate the solutions that your business provides to that person. This helps establish the fact that you took that person’s needs into consideration when putting the deal together. What more can you ask for than a partner who looks out for your needs in a business deal? Use the 11 tips to get ahead and gain the advantage over your competitors. Carry out the actionable advice contained here. 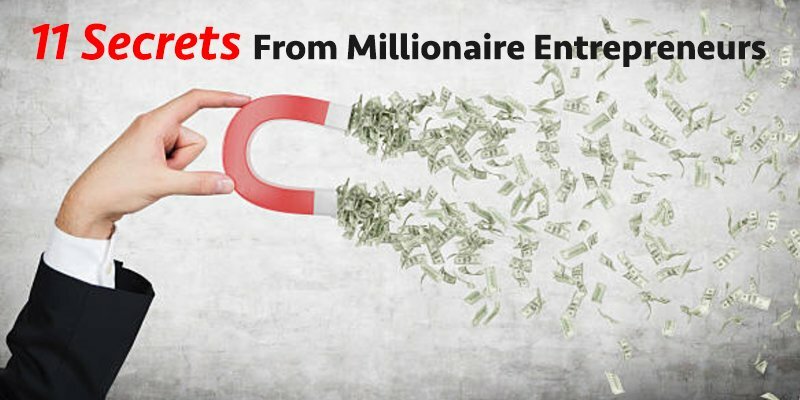 Here’s hoping you become just like on the millionaire entrepreneurs we featured.